the Reference set editor to manage the members. The user interface of the editor changes, dependent on the type of reference set. The simple type reference set is a plain grouping of concepts by user preferences. 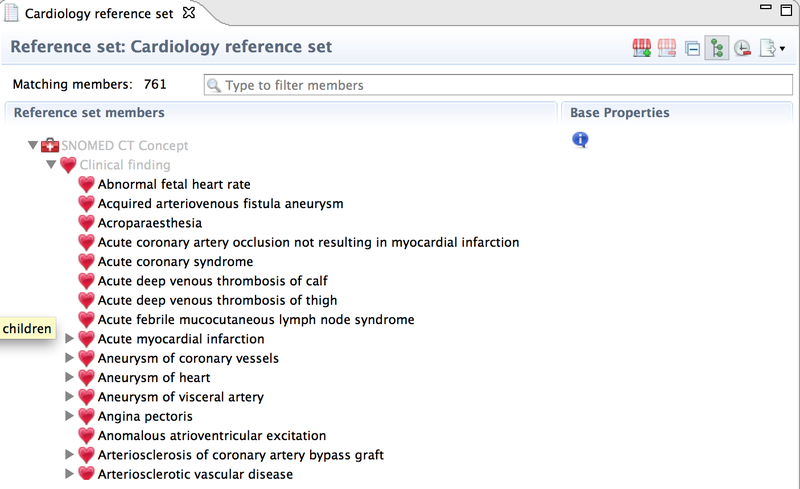 The concepts can be added one-by-one or in a batch mode from the navigator or the search view. An attribute-value type reference set allows associating a value concept with the referenced component. It can be used to extend the ontology with custom properties on the concept. It's also possible to add descriptions as referenced components. Query type reference sets are referencing to a simple type reference set and associating it with an ESCG query. The referenced simple type contains the results of the query expression. When saving a query-type reference set, the queries are executed. This means that simple type reference sets with the results of the query are automatically generated. 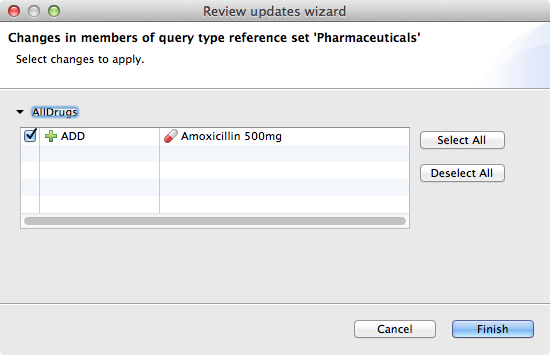 The query name is used as the name for the generated reference set. A query type reference set can include multiple ESCG queries and therefore, contain references to multiple simple type reference sets. When adding a member to the query-type reference set, the syntax is displayed in ESCG formatting. Query type reference sets and the generated simple type reference sets can be automatically updated following (e.g.) a new release of an underlying terminology. The action can be applied either on an individual intensional reference set or on the entire set of query type reference sets and will refresh all the generated simple type reference sets. 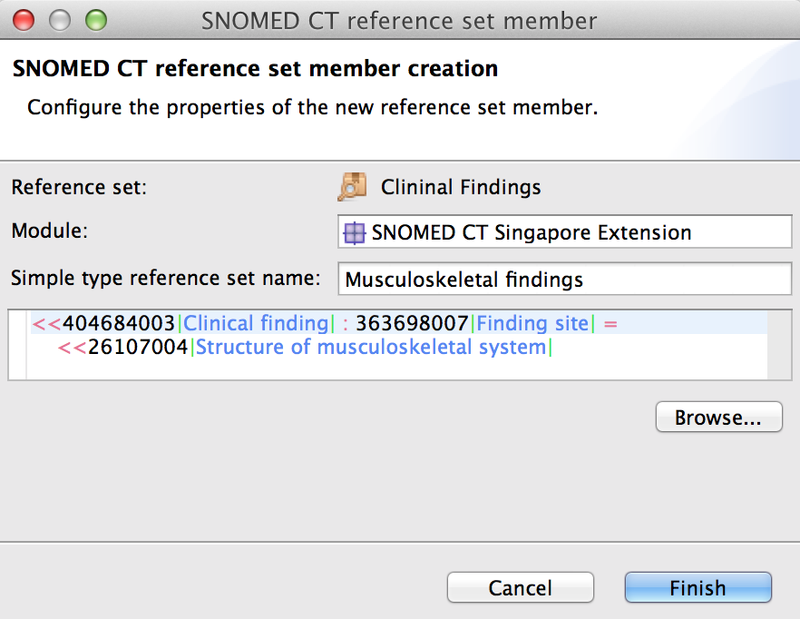 For example, when a new version of SNOMED CT is released, all the reference sets can be updated and will display any changes that would be included by re-running the queries. 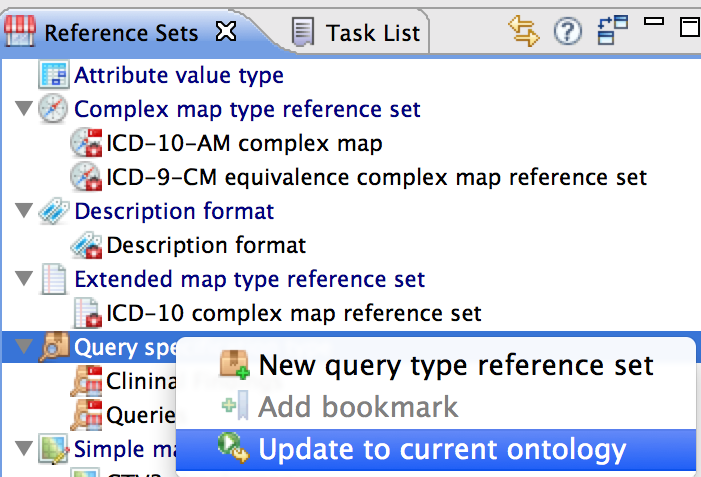 To update an individual reference set, click on the Update to current ontology button in the editor. If you want to update all reference sets, right-click on the root folder for query type reference sets in the view and select Update to current ontology. After the update, the changes can be reviewed; the corresponding reference sets will reflect the ontology changes as well. 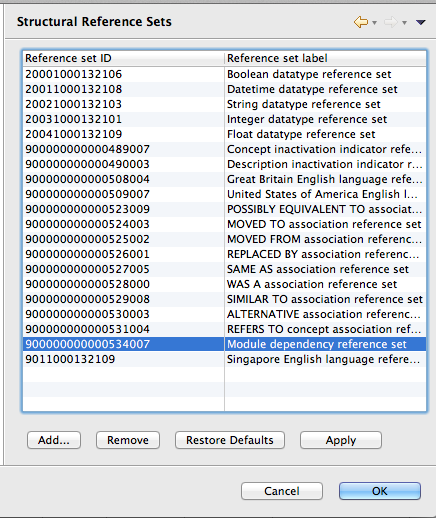 RF2 uses language type reference sets to indicate preferred and acceptable descriptions for a particular language. Snow Owl uses this information in conjunction with the language preferences setting (Preferences > Snow Owl > Language Codes) to identify and display preferred terms. 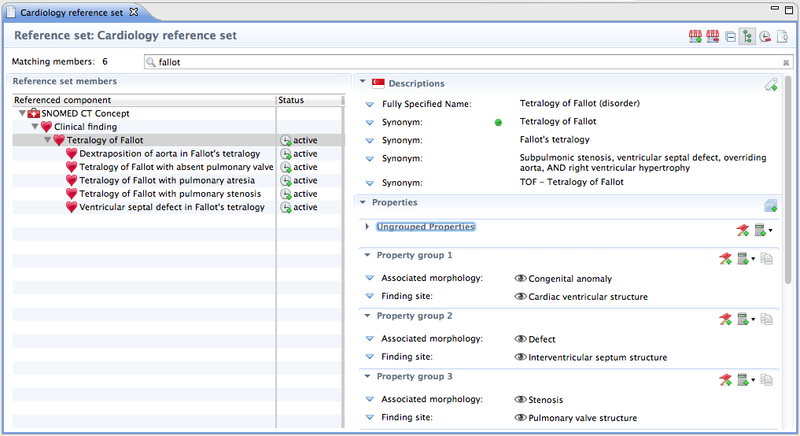 When a new concept is added, the preferred term specified in the new concept wizard is automatically added to the active language type reference set. Direct editing - due to the huge size - is disabled, therefor they can't be opened on the user interface. 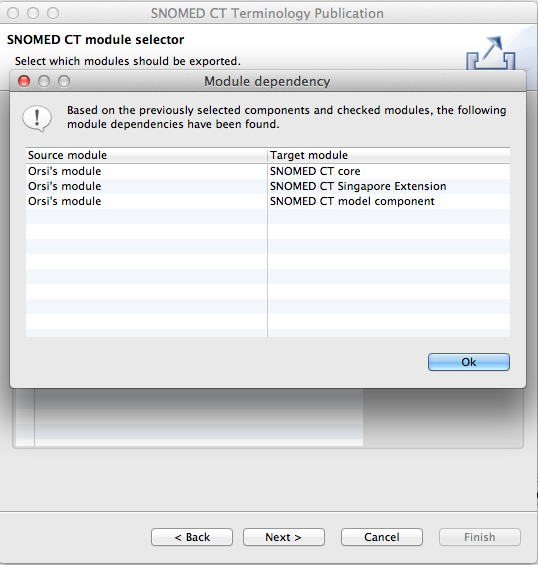 Dependencies between module versions are represented in the IHTSDO module dependency reference set (see screenshot). Snow Owl supports the import, automatic update and publication of the IHTSDO module dependency reference set. 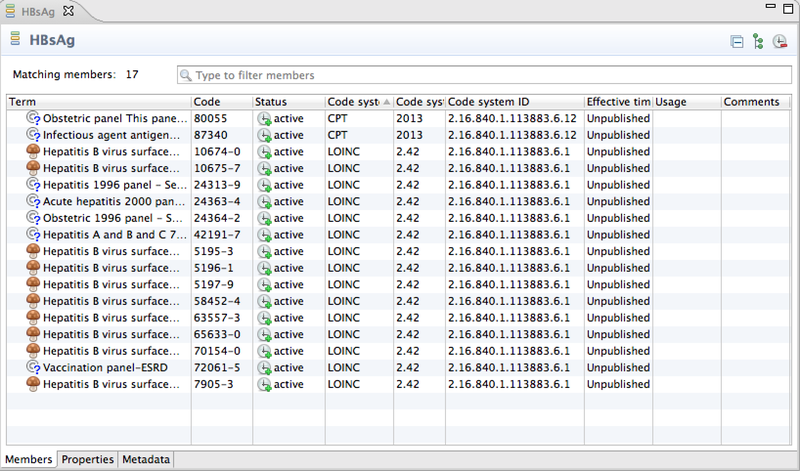 When importing new components, Snow Owl validates if all the module dependencies are satisfied. This way, invalid import attempts can be detected and fixed easily. The module dependency reference set is a structural reference set, that is updated behind the scenes. Module dependencies are not manually editable. A list of the imported structural reference can be found at File > Preferences > Snow Owl > Structural reference sets. When creating a new module, the module dependency reference set is automatically updated. The new module will have dependencies to the IHTSDO model component module, as the model components are required for the concept definition. Additional dependencies are calculated based on the components created under this module. For more information about adding dependencies during export please refer to the Importing, Exporting, and Publishing section. 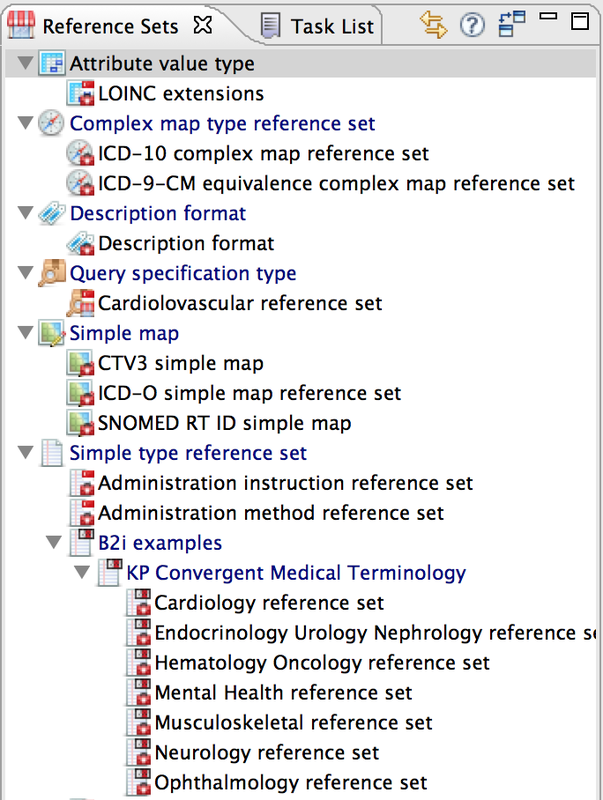 Simple and complex map type reference sets are discussed in the Mapping section. Snow Owl allows creating value domains which can contain references to concepts and codes from different terminologies. Each value domain allows defining additional metadata that is associated with that value domain. 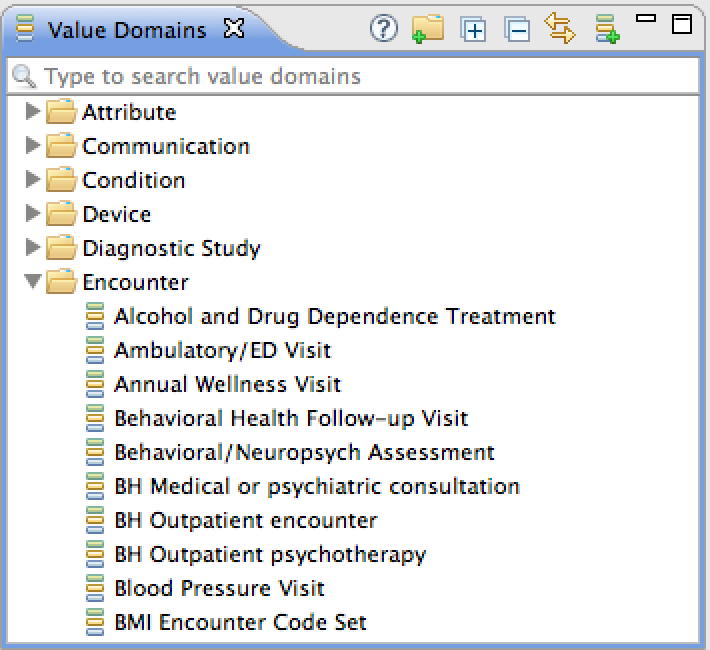 Value domains can be browsed and searched in the Value Domains Navigator. To view and edit a value domain, double-click a member to open the editor.